The wide range of detrimental flow-on effects triggered by climate change continues to surprise scientists. An article in the latest issue ofGeophysical Research Letters reveals how climate change appears to be contributing to the release of high levels of mercury in the northern wetlands of North America. The new report was compiled by Michigan State University (MSU) researcher Merritt Turetsky, working closely with the U.S. Geological Survey. Humans have been releasing mercury into the atmosphere since the start of the Industrial Revolution. Eventually, it falls back to Earth – more often than not in North American wetland areas – where it is sequestered by the peat soils. While mercury is poisonous and ideally not something you’d really want in wetlands; the cold, wet soils of the boreal forest region in Alaska and northern Canada are in fact efficient resting places for mercury. “This type of wetland is actually doing us a service. Peat lands have been storing mercury from the atmosphere since well before and during the Industrial Revolution, locking it in peat where it’s not causing any biological harm, away from the food web,” explained Turetsky. To compile the report, Turestsky and his co-researchers measured the amount of mercury stored in soils and vegetation of forests and peat lands; then used historical burn areas and emission models to estimate how much of that mercury is released into the atmosphere during fires. 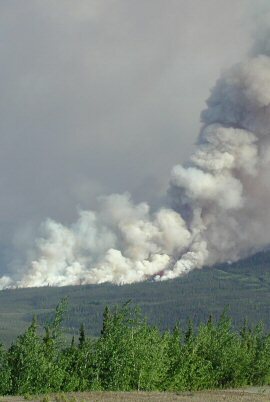 The researchers also sampled smoke plumes to measure atmospheric mercury levels as fires burnt.